Manufactured from FKM synthetic rubber, the new Patent Pending VIPSealChem is the latest addition to the VIPSeal® range for use in low and non-pressurised applications where a high chemical resistance is required and other synthetic rubber materials such as EPDM, SBR and NBR are unsuitable. 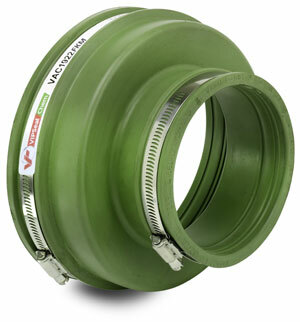 VIPSealChem chemical couplings are manufactured to meet the demanding requirements of EN681-1 WB/WD and EN295-4 and along with providing a flexible and watertight connection on above and below ground drainage systems that require high resistance to a wide range of chemicals, VIPSealChem also operates in a wide range of temperatures. As VIPSealChem’s chemical resistant properties lie in the FKM synthetic rubber that is used to manufacture the seal, there is no need for the use of a fluoropolymer (FEP) liner or expanded PTFE seals (which are commonly used on other chemical resistant sealing solutions). Because of this, they are as simple to install as any other seal within the VIPSeal® range, allowing dramatic time savings to be made on both installation and repairs along with providing a more consistent sealing performance. By not using a fluoropolymer (FEP) liner or expanded PTFE seals, VIPSealChem is able to be manufactured as an adaptor coupling. This application allows pipes with significantly different outside diameters to be joined, ensuring VIPSealChem can be used without the needs to make further alterations to existing pipes or prefabricated structures. FKM can be rated for long term service at 200⁰C without marked degradation of either the molecular structure or mechanical properties of the polymer. Under some service conditions and for reduced periods of exposure, temperature of above 300⁰C can be tolerated. FKM is also serviceable in dynamic applications down to -15⁰C and in static applications will perform well down to -30⁰C. For applications where an extreme temperature resistance is required but aggressive chemicals are not present, VIPSeal® flexible couplings can be manufactured in peroxide cured EPDM (EPDMp). Speak to our technical department for further details. or contact 0800 334 5547 and ask for the technical department. 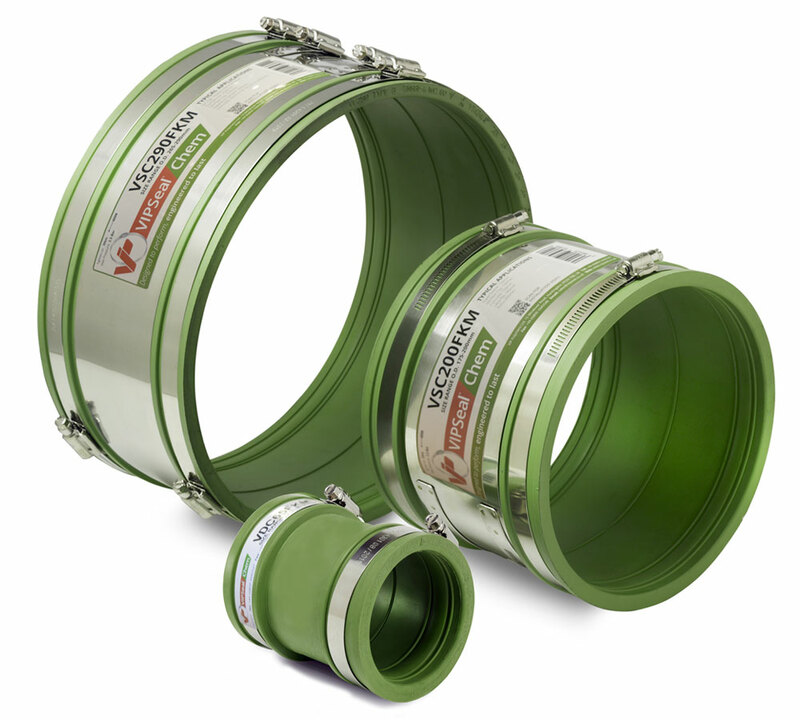 From cutting the pipe to achieving a complete watertight seal, our step by step walkthrough shows you exactly how to install our VIPSealChem couplings. View all sizing options for VIPSealChem couplings in our information table.